The third Wainwright (DLG-28) was laid down on 2 July 1962 at Bath, Maine, by the Bath Iron Works Corp.; launched on 25 April 1965; sponsored by Mrs. Richard W. Wainwright; and commissioned on 8 January 1966 at the Boston Naval Shipyard, Capt. Robert P. Foreman in command. Between January and May, the guided missile frigate completed her outfitting at Boston. On 21 May, she departed Boston, initially to test the Navy's newest sonar equipment and then to proceed to her home port, Charleston, S.C. During the months of June, July, and early August, she operated out of that port along- the eastern seaboard and in the West Indies. During this period, she made six highly successful missile firings on the Atlantic Fleet weapon range and conducted a three-day search for an unidentified submarine contact. Though no positive identification of the submarine could be made, Wainwright did establish contact with her new long-range sonar and then tracked the vessel for a time. On 13 August, the ship returned to Charleston for 15 days of upkeep in preparation for shakedown training, upon which she embarked on 28 August. At theconclusion of shakedown, she proceeded to Culebra Island for both gun and Terrier missile shoots. She returned to Charleston in October to prepare for the annual Atlantic Fleet exercise. On 28 November, the guided missile frigate stood out of Charleston for 17 days of drills, including replenishment exercises, weapon coordination drills, and formation steaming maneuvers and tactics. She returned home on 16 December and ended the year in a leave and upkeep status. On 6 January 1967, Wainwright got underway for Boston and post-shakedown availability. She concluded that repair period and headed back to Charleston on 15 March. Following local operations there, the guided missile frigate embarked upon her first deployment to the western Pacific on 10 April. She transited the Panama Canal a week later and arrived in San Diego, Calif., on the 23d. For almost a month, she conducted exercises off the coast of southern California before heading west on 15 May. After brief stops at Pearl Harbor and Guam, Wainwright entered Subic Bay in the Philippines on 3 June. Three days later, she arrived on station in the Tonkin Gulf and, on the 8th, took over positive identification radar advisory zone (PIRAZ) duties from Long Beach (CGN-9). In that capacity, Wainwright maintained constant radar and visual surveillance of the gulf and adjoining coasts for the purpose of identifying all aircraft in the zone and vectoring defensive forces to the interception of any possible airborne enemy intruders. Because of the relative immobility necessary to those duties, she also served as a reference point -to guide American strike aircraft to their targets ashore. Since her duties afforded her a continual picture of the events occurring in the air over the zone, she also served as a base for search and rescue (SAR) helicopters. During that first line period, one SAR helicopter crashed Wainwright's flight deck area; but the damage proved to be minimal, and the frigate was able to resume full-scale flight operations the following day. The guided missile frigate ended 1967 and began 1968 at Charleston. On 19 January 1968, she exited her home port and headed for Newport, R.I., where she served as school ship for the Destroyer School from 21 January to 3 February before returning to Charleston on the 5th. Her operations from her home port- including Operation "Rugby Match" exercises in the West Indies-lasted until she sailed for the western Pacific on 24 June. The warship transited the Panama Canal on 29 June, stopped briefly at Pearl Harbor from 11 to 15 July and at Guam on the 21st, and arrived at Subic Bay on the 26th. Four days later, she embarked upon the first tour of combat duty of her 1968 deployment. She stopped at Danang for briefings on 2 August and then relieved Sterett (DLG-31) on PIRAZ station on the 4th. During the following 41 days, she left her station only once-to evade a typhoon-and returned immediately after the storm passed. On 14 September, she turned PIRAZ duties back over to Sterett and steamed off for a month of port visits which included a brief upkeep period at Subic Bay followed by calls at Hong Kong and Yokosuka. On 13 October, she headed from Japan directly to the PIRAZ station and relieved Sterett once more. 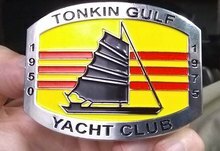 The 27 days of her second line period passed even more routinely than those of the first, and she cleared the Tonkin Gulf on 15 November for a four-day upkeep in Sasebo from the 19th to the 23d. Back on station on the 28th, Wainwright concluded the year as the Navy's air coordinator in the northern portion of the Tonkin Gulf. The warship spent the first three days of 1969 winding up her third and final tour of duty as PIRAZ ship and then set a course for the Philippines, the first pause on her way home. After stopping at Subic Bay from 5 to 9 January, she continued her roundabout voyage to Charleston, stopping along the way at Sydney, Australia; Auckland, New Zealand; and Papeete, Tahiti. She passed back through the Panama Canal on 11 February, stopped at St. Thomas for a two-day visit on the 15th, and reached Charleston on the 21st. Following a month of leave and upkeep, Wainwright underwent a whole series of inspections at Charleston that spring. During the middle of May, she steamed north to Norfolk where she participated in the Presidential Seapower Demonstration conducted in the Virginia capes operating area. At the conclusion of that event on 19 May, she headed south for the multifaceted combat exercise, "Exotic Dancer." For the first two weeks of June, Waimvrigh t remained in the West Indies and participated in the NATO antisubmarine warfare exercise, "Spark Plug," along with ships of the navies of Canada, Great Britain, the Netherlands, and Por-tugual. That exercise ended on 11 June, and the frigate proceeded to Newport where she disembarked the Commander, Cruiser-Destroyer Flotilla 2. She returned to Charleston on 16 June and spent all but two days of the next two months in port. On 18 August, Wainwright entered the Charleston Naval Shipyard for her first regular overhaul. On 16 February 1970, the ship returned to operational status. Training off the Florida coast followed by more of the same off the Virginia capes occupied her until mid-March. After three days in Charleston, Wainwright got underway for gunnery and missile shoots on the Atlantic Fleet weapons range near Puerto Rico. Refresher training out of GuantanamoBay followed in April, but it was interrupted by two special assignments. On 26 April, she received orders to intercept three Haitian Coast Guard vessels fleeing that country in the wake of an unsuccessful coup. The ship encountered one near the entrance to Guantanamo Bay; but, observing American port officials boarding the ship peacefully, she continued on her way. Later, Wainwright found the other two ships and escorted them back to Guantanamo Bay for temporary asylum. Later, on 10 May, she put to sea to intercept quite a different force-a Soviet task group. That night, she came upon two of the Russian ships, a guided missile cruiser and a guided missile destroyer. The following day, two submarines, an oiler, and a submarine tender rendezvoused with the first two ships; and all six entered port at Cienfuegos, Cuba, on the 14th. The next day, Wainwright returned to Guantanamo Bay to resume refresher training. Less than a month later, on 12 June, she moored at Charleston for two months of upkeep and training in preparation for her forthcoming deployment to the Far East. On 25 August, the guided missile frigate stood out of Charleston, bound for her third and final deployment to the western Pacific in conjunction with the Vietnam conflict. Steaming via the Panama Canal and Pearl Harbor, she arrived in Yokosuka, Japan, on 21 September. For almost two months, she conducted operations in Japanese waters-primarily bilateral ASW exercises in the Sea of Japan with units of the Japanese Maritime Self Defense Force. Periodically, the warship put into Yokosuka and Sasebo for upkeep and liberty. Wainwright departed Japan on 14 November and headed via the Taiwan Strait for the Tonkin Gulf. On the 20th, she relieved Jouett (DLG-29) on PIRAZ station and took up familiar duty as the American air coordinator in the northern part of the gulf. That assignment proved very brief for, on the following day, Chicago (CG-11) relieved Wainwright; and the guided missile frigate moved on to new duties as the coordinator ship assigned to the north SAR station. For almost a month, she alternated between north and south SAR stations, taking time briefly in mid-December to participate in Operation "Beacon Tower," a three-day exercise to test the readiness of American warships in the Tonkin Gulf to meet and deal with air and surface attacks. On 16 December, Wainwright left the combat zone, bound for Singapore, where she remained from 19 to 26 December. From there, she set a course for the Philippines and arrived in Subic Bay on the 29th. 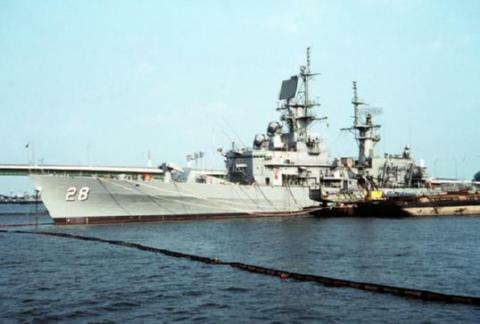 The warship completed six days in port at Subic Bay on 4 January 1971 and got underway for Hong Kong. She returned briefly to Subic Bay, however, for repairs to one of her radar antennae but finally reached Hong Kong on the llth. Following a four-day visit, she stood out of the British colony on her way to the Tonkin Gulf. She served 16 days in the gulf, dividing her time between PIRAZ duties and assignments as the northern SAR ship. After a final two-day stop at Subic Bay, Wainwright began the long voyage back to Charleston which took her through the Indian Ocean, around the Cape of Good Hope, and across the southern Atlantic to complete her first circumnavigation of the globe. Along the way, she made a series of calls at African and South American ports, beginning with Djibouti in French Somaliland. From there, she headed for Massawa, Ethiopia, where she participated in the celebration of the Ethiopian Navy Day, during which she joined ships of other nations in observing the graduation of midshipmen from the Ethiopian Naval Academy and hosted then-Emperor Haile Selassie I on board. She rounded out her African itinerary with calls at Diego Suarez, Madagascar, and at Lourenco Marques, Mozambique, before rounding the cape and heading across the Atlantic toward Brazil. Visits to Rio de Janeiro and Recife in Brazil and at St. Thomas in the Virgin Islands preceded gunfire support training and a missile shoot at Culebra Island. On 2 April, Wainwright steamed into Charleston and began an extended standdown period. Upon completion of a 59-day post-deployment stand-down, Wainwright resumed operations early in June as a unit of the Atlantic Fleet Cruiser-Destroyer Force. She spent much of June in the Caribbean undergoing gunnery and missile training and returned to Charleston on the 19th. Four days later, work began on the installation of a light airborne multipurpose system (LAMPS). Those modifications were completed by mid-July, and Wainwright occupied the following four months with operations along the eastern seaboard in conjunction with the initial evaluation of her LAMPS helicopter. A tender availability followed by the conversion of her propulsion plant to burn Navy distillate fuel brought the year to a close at Charleston. The warship completed the conversion on 11 January 1972 and had resumed operations at sea out of Charleston by the 24th. For the next nine months, she tested her new LAMPS installation, made port visits to Atlantic and gulf coast ports, and participated in the usual 2d Fleet exercises. Those duties took her from the southeastern coast of Texas to the West Indies and thence as far north as Maine. By late November, she was at Charleston preparing for her first tour of duty in the Mediterranean Sea. On 1 December, Wainwright stood out of Charleston and set a course for Rota, Spain, where she arrived on the 10th. After changing operational control from the 2d to the 6th Fleet, the guided missile frigate departed Rota on the 11th and entered the Mediterranean. Conducting ASW and antiair warfare (AAW) exercises, the warship headed across the Mediterranean -stopping at Barcelona from 20 to 26 December and arriving in Naples, Italy, on the 30th. She departed that port on 6 January 1973, and headed for the Ionian Sea. During ASW exercises in Greek waters, Wainwright contacted, tracked, and positively identified four Soviet submarines in spite of their strenuous efforts to evade. Upon completing those exercises, she headed for the southern coast of France, arriving in Marseille on the 17th for a two-day visit. More AAW exercises followed, as did port visits to Palma de Mallorca; Malaga, Spain; and Genoa, Italy. On 17 February, she departed Genoa in company with the Italian cruiser Vittorio Veneto to participate in National Week XV, a multinational naval exercise of broad scope conducted across the Central Mediterranean. In addition to the Americans and Italians, units of the Greek and Turkish navies also participated in drills and battle exercises extending westward from Crete to the Strait of Messina between Sicily and the toe of the Italian boot. After National Week XV, Wainwright punctuated a series of 6th Fleet ASW and AAW exercises with visits to many of the ports already mentioned as well as at Athens, Greece; Civitavecchia and Livorno, Italy; and Golfe Juan, France. On 17 June, she steamed from Palma de Mallorca through the Strait of Gibraltar to Rota on the Atlantic coast of Spain. There, she turned her duties over to Belknap (DLG-26) on the 21st. That same day, she departed Rota for Lisbon, Portugal, where she joined Guam (LPH-9) and Bowen (DE-1074) in preparation for a transatlantic exercise to test the concept of the sea control ship. The three warships departed Lisbon on the 28th. The exercise lasted from 28 June to 8 July, during which time Wainwright vectored Gwom-based Harrier aircraft to the interception of two Soviet "Bear" aircraft. Just before the conclusion of the exercise on 8 July, Wainwright ventured across the Arctic Circle briefly before setting a course for Charleston. The guided misile frigate concluded her first Mediterranean deployment on 20 July and began her standdown period at Charleston. On 10 September, she entered the Charleston Naval Shipyard for her second regular overhaul. Wainwright completed sea trials, the final phase of overhaul, between 10 and 14 June 1974 and officially rejoined the Atlantic Fleet on 20 June at the Charleston Naval Station. For the remainder of the year, the warship was busy with refresher training, a myriad of tests, qualifications, inspections, and evaluations, and other normal 2d Fleet operations conducted along the southern Atlantic coast and in the Caribbean. The beginning of 1975 brought another period in drydock- this time at the Norfolk Naval Shipyard-for repairs to her sonar dome. She returned to Charleston on 1 February 1975 and resumed tests and inspections in preparation for her second deployment to European waters. On 5 March, she stood down the Cooper River on her way to Europe. En route to the Mediterranean, the guided missile frigate joined Forrestal (CV-59) and Tunney (SSN-682) in a series of ASW, surface, and air action drills, at the conclusion of which Wainwright continued on her way to Spain. She changed operational control to the 6th Fleet while at Rota between 15 and 17 March. The warship entered the "middle sea" on the latter date and arrived in her first Mediterranean port of call-Naples, Italy -on the 22d. As during her previous Mediterranean cruise, she engaged in one training exercise after another, but interrupted that schedule almost as frequently for port calls all along the Mediterranean coast of Europe. Late in April, a missile-firing exercise was interrupted by a snoopy Soviet destroyer and had to be postponed until the following day. June proved to be an important month in Wain-wright's history, for it was during the latter part of that month that she transited the Straits of the Bos-phorus and the Dardanelles into the Black Sea and became the first American ship to visit Rumania- at the port city of Constanta-in 49 years. After concluding that visit on the 24th and passing back into the Mediterranean on the 25th, she conducted a brief surveillance of the Soviet helicopter carrier Leningrad before resuming her schedule of training exercises and port visits. On 30 June, Wainwright was redesignated a guided missile cruiser, CG-28. Her second tour of duty with the 6th Fleet lasted until late August. On the 22d, she made a one-day stop at Rota; then headed home. Nine days later, she moored at Charleston and, for the remainder of the year, resumed a routine of 2d Fleet operations, inspections, and upkeep. Following a spring of special operations and underway training out of Charleston, Wainwright got underway on 30 June for New York and her big events for 1976-the International Naval Review and Operation "Sail," both in honor of the United States' Bicentennial birthday. To the guided missile cruiser went the signal honor of being the focal point of both events-serving as flagship for the naval review and as reviewing ship for Operation "Sail." During her service in those two capacities, she entertained Vice President Nelson D. Rockefeller, Secretary of State Kissinger, Secretary of Defense Rumsfeld, Admiral James L. Holloway, III, Chief of Naval Operations, and Admiral Shanahan, Commander, 2d Fleet. All too quickly, however, the celebration of 4 July 1976 ended. On 6 July, the ship departed New York and headed back to Charleston to resume her more mundane schedule of special operations and training cruises. That routine-spiced liberally with tests, inspections, evaluations, and certifications- saw her through the Bicentennial year and the first three months of 1977. On 31 March 1977, Wainwright embarked upon her third deployment to the Mediteranean. She joined the 6th Fleet officially upon arrival in Rota on 12 April and actually entered the Mediterranean the following day. Port visits and an almost incessant schedule of training exercises-ASW drills, AAW practice, missile shoots, multinational and bilateral exercises-occupied her once again. During June, she visited the Black Sea once more, but otherwise, her routine was similar to that she had experienced in previous tours of duty with the 6th Fleet. She concluded her Mediterranean operations at Rota at the end of the first week in October and arrived back in Charleston on the 21st. For the remaining two months of 1977, typical 2d Fleet operations out of Charleston filled her schedule. January 1978 was spent in grooming for a multi-threat training exercise, "READEX 1-78," which took place in February in the southern Florida and Caribbean operating areas. Returning to Charleston late in the month, Wainwright entered the Charleston Naval Shipyard on 23 February for the commencement of a scheduled 13-month overhaul which concluded in March 1979. Wainwright received four battle stars for Vietnam service.